It's the monster we all think about every October, but not because of the appearance of Halloween. With the 10th month of the year being designated as National Breast Cancer Awareness month, millions across the country think about someone close to them who bears the scars of the monster known as breast cancer. Even worse, many think of a loved one – a mother, a wife, a daughter, a sister, a good friend – who has battled the monster up close and personal, eventually losing that battle once and for all. All across the nation, countless families and individuals show their support by wearing pink to raise breast cancer awareness to helping raise funds aimed at one day ending the monster's terrible reign. 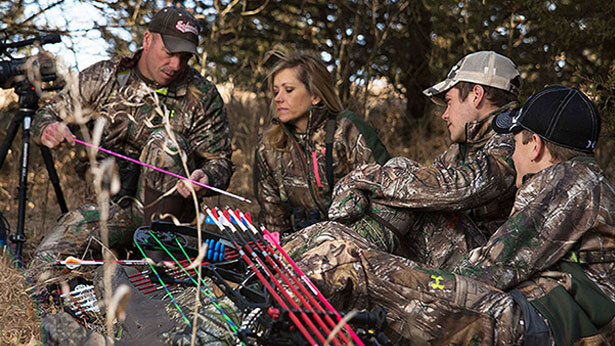 For Raised Hunting's David and Karin Holder, their support occurs one arrow at a time as they wrap an arrow in pink and carry it in their quiver to remind them of the courageous battle fought a few years ago by a dear friend. And of the small part that they can play through their hunting television show on Outdoor Channel to raise awareness of the deadly disease and help raise funds aimed at finding a cure. "About eight years ago, my best friend, David Mitchell, a firefighter in Montana, got the news that his wife, Tammi, had been diagnosed with breast cancer," said David Holder. "She was able to eventually win the battle and is still with us today and has in fact, been free of cancer for a few years now. "But it was a terrible time for their family and my friend, David, was scared to death for several months that he was going to lose his wife." This led to the beginning of the pink arrows David, his wife, Karin, and their sons, Warren and Easton, all carry in their quivers each fall. "Back when Tammi was sick, I thought that there was nothing that I could do other than be there, to listen, to pray and to offer support to them," said David. "But then I heard about a couple of different arrow companies that were making pink arrows and I thought, you know what, I can carry one of those in my quiver. That would help me not take good health for granted and to remember that there are people out there fighting this terrible disease." So that's what David Holder did, obtaining a pink arrow and sticking it in his quiver. After talking it over with his wife, Karin, she also was intrigued. "Karin thought it was a great idea and told me 'I want one for my quiver too," said David. Karin's motivation was partly through watching their friend battle breast cancer and partly because she deals with the deadly disease's scourge frequently as she helps counsel women on monetary and insurance decisions thanks to her position in the financial industry. "I have not personally suffered from breast cancer in my own family, but in my other career, breast cancer has had a huge impact on people I know," said Karin. "I've had numerous women as clients whose lives have been touched by breast cancer. It's really hard to watch them suffer and battle this disease, women you've been close to, who have been friends and clients for as long as 12 to 15 years. "Some of our conversations get really deep after a diagnosis occurs, since we're talking about what to do with retirement funds, life insurance needs, etc. Karin noted that one such call came recently as a client received a breast cancer diagnosis: "When one of my clients gets that call, it changes everything." Aside from financial considerations, Karin has observed the physical and emotional toll that the disease takes on women and their families. And whether friend, client or both, Karin has always has a desire to help those afflicted with this disease. "You know that you want to offer as much help as you can," she said. "But it can be awkward too since there's not much more that you can do other than to tell them that you love them, that you're there for them, that you will pray for them and things of that nature. "Really, it's more of an emotional support that you're offering to them as you try to be compassionate, understanding of what their dealing with and being aware of what their family might be going through. You just want to try and be as helpful as possible." David agrees, remembering keenly the fear that existed in his friend's life after his wife was diagnosed with breast cancer several years ago. "When a grown man, your best friend, calls you up and tells you this devastating news and you can't understand what he is saying through the phone because of all of the tears, you just know that something is wrong the moment that you pick up the phone," David recalled. "Karin and I are not the kind of people – and we're raising our boys to be this way too – to just sit around and not try to do anything. We've got to figure out what can we do to help." Which led to the pink arrow idea. "We don't know much about this disease or what to do about it, but we do know something about hunting," said David. "And maybe in some small way through the pink arrow, we feel it's a way that we can at least do something." As others in the hunting world began to observe the pink arrow, questions began to arise as to why the husband-and-wife hunting team carried such an arrow in their quivers. After several such conversations, David realized that some hunting industry professionals couldn't carry such an arrow because of contractual obligations with other arrow companies that didn't make a pink-hued arrow. This led to the idea of developing an arrow wrap, one that could convert any brand of arrow into a pink arrow. "It took a couple of years to figure it all out, but we finally decided that we could do that ourselves," said David. "So we were able to come out with a pink arrow wrap that anyone could use to help promote awareness about breast cancer and to help raise some funds aimed at furthering research into prevention, treatment and one day, a cure." The "Power in Pink" arrow wraps – available at www.raisedhunting.com – can be used individually to partially wrap arrows or in groups of three to completely wrap arrows in pink. With the Raised Hunting logo, a pink breast cancer awareness ribbon and the tag "Raising Awareness," the Holders' aim is to donate funds generated from the sale of these arrow wraps to the National Breast Cancer Foundation (www.nationalbreastcancer.org). "Since we started doing this, our boys now carry a pink arrow in their quiver and several friends carry a pink arrow in their quiver," said David. While he admits that the funds generated by the sale of these arrow wraps is modest at the moment, David is hopeful that it can still do some good. "I hope that by selling these wraps, one day, we can write a good-sized check that will make a bigger difference," said David. "I would love to think that one day, such a check could have a whole bunch of zeroes behind it. Right now, even if it's only $100, that's something." Others are beginning to notice the pink arrows in the field and on the Holder's popular television hunting show on Outdoor Channel. "People are noticing, it's something that Raised Hunting is becoming known for," said David. "We just started sharing it this year and we're getting others to do it now too. In fact, we'll have an entire episode of Raised Hunting devoted to this subject matter in 2016." "We've probably heard from a few thousand people over the years about the pink arrows that we carry," said Karin. "This arrow doesn't get used. It's special, it's a symbol of life, it's a symbol of survival, it's a symbol of (love and hope). "We certainly hope to encourage other hunters out there to have one pink arrow in their quivers." David Holder admits that such a gesture isn't much in the overall scheme of things. "We can't help everyone and we can't solve this alone, but maybe we can make a little bit of a difference," he said. "It's not a lot of dollars, but maybe if it's enough to make one more person aware of this disease, to get screened, to detect it early and to battle it and win, that's got to be good enough, at least for right now." What would David Holder say to someone who is battling the disease and argues that such gestures, while kind and well meaning, simply aren't enough in light of this terrible killer that ravages so many? "I get it," he said. "Cancer is so unforgiving. It doesn't pick and choose … it's not fair. "I understand that someone who is battling this disease might be angry and I understand why they may have reason to feel that away, more so than any other person on the face of the earth. "But all we're trying to do is to help, in any way that we can." And that's one pink arrow at a time.